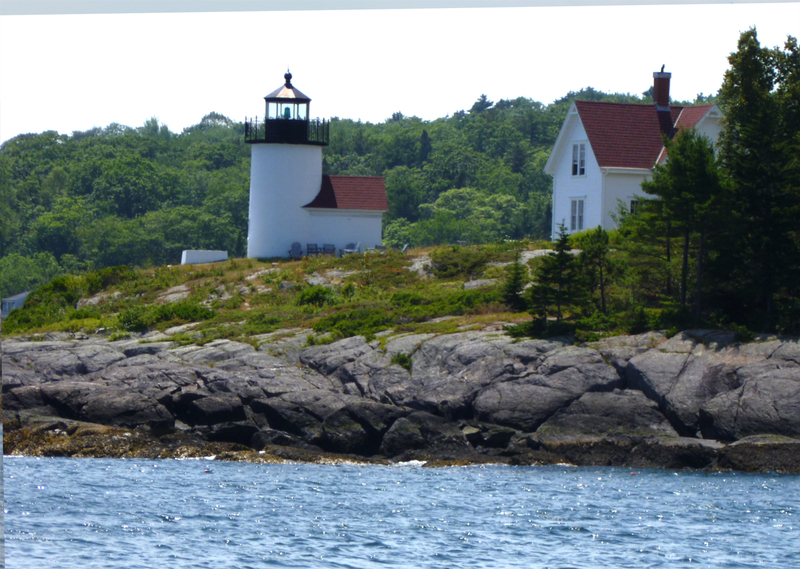 Our destination for today is Camden Harbor, just six miles from Rockland. There is a warm breeze out of the west. We escape the heat and humidity by sailing a series of tacks parallel to the western shore of Penobscot Bay. With deep water and a light breeze, we can enjoy this daysail without being particularly attentive to the charts. The Camden Hills create a lush green backdrop for our liesurely sail. Camden refers to itself as “where the mountains meet the sea”. This gorgeous setting is unlike anything we have witnessed thusfar on our summer cruise. By mid-afternoon, Cutter Loose is tied to a mooring in Camden Harbor. The wind in the harbor is a 15 knot downdraft from Mount Battie, which helps to abate the afternoon heat. The harbor is filled with interesting sailing vessels. Since leaving Portland, we have noticed that there are fewer large powerboats cruising Penobscot Bay. The vast majority of boats in Tenants Harbor, Rockland and Camden are sailing vessels. We dinghy ashore to re-familiarize ourselves with Camden. At the Owl and Turtle Bookshop, we purchase tickets for a local theatrical performance…a comedy entitled 39 Steps. But, there is a slight catch. The salesperson at the bookstore explains that tonight’s performance will be presented at the Rockport Opera House located about two miles from Camden. He provides explicit walking directions to Rockport. Being supporters of the arts and avid hikers, we view this as a dual opportunity to visit Rockport (as opposed to Rockland) while getting in some some needed exercise. The 45 minute hike past historic houses and farms is pleasant, but the wind has now become calm and the heat and humidy are oppressive. 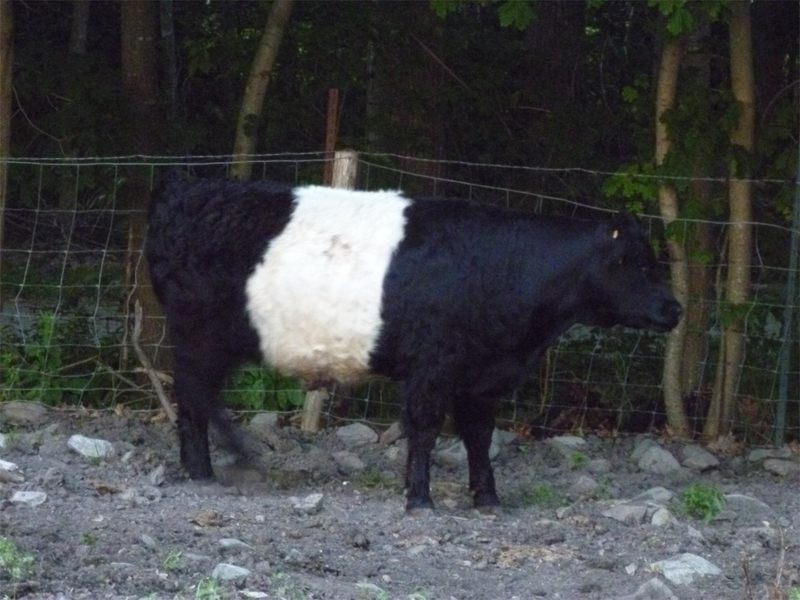 We walk by Aldemere, a farm that raises Belted Galloways. “Belties” are a breed of cattle with white midsections. We arrive in Rockport in plenty of time for the performance, but soaked with perspiration. We are hopeful that the auditorium is air conditioned. But the Opera House is locked and there are no patrons in sight. There will be no performance here in Rockport tonight. After enjoying a refreshing glass of lemonade in Rockport, we hike back to Camden and stop at the Opera House where the final act of 39 Steps is underway. We must have another conversation with the bookstore clerk in the morning. But in the meantime, we stroll the pleasant streets of Camden before boarding the dinghy for the return trip to Cutter Loose.